My mother and her current dancing partner, Coffee. Today’s post is by a guest author – Rhonda Scott, my mother. Enjoy. There has been a lot of chatter recently, throughout social media, regarding what is or isn’t Classical Dressage. All of the shouting brought back a single memory that I cherish to this day. 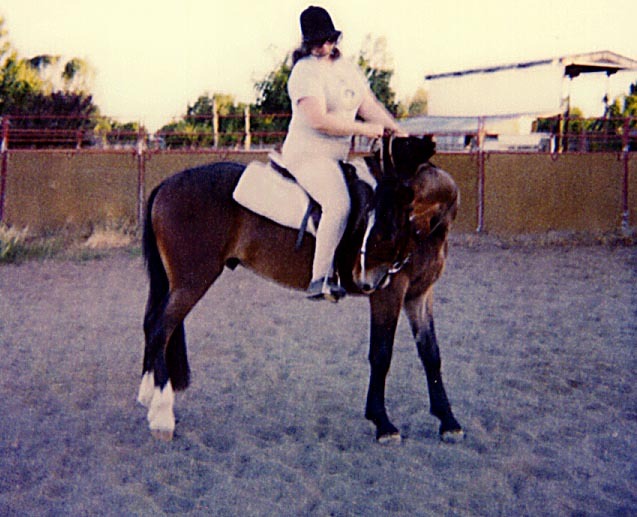 I am a non-competitive rider, seventy seven years of age, who watched the young ones learn as a Pony Club mom and District Commissioner. 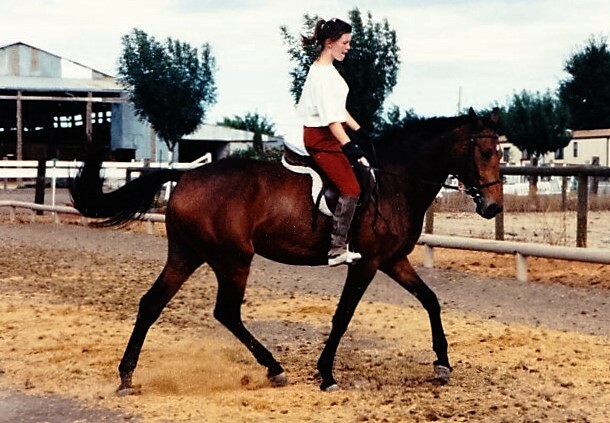 In my late forties my (now grown) daughter started giving me lessons on her old reliable, as she developed her mare “Dani” into a lovely “ballerina”. I do not plan on addressing the classical question, this is a comment only on one moment in my life, and the feeling/emotions I was left with. To offer a little background you must be cognizant of the fact that my body is, and has always been, stiff, rigid and resistant to isolating parts for freer movement. Add to this a somewhat unfocused mind and the equation does not equal a natural rider. My daughter/trainer endured many tears and protests while I endured “let go of the reins” and “ get off that horse you are ruining it” many times over. Nevertheless we persevered and I became a somewhat competent, more confident rider. 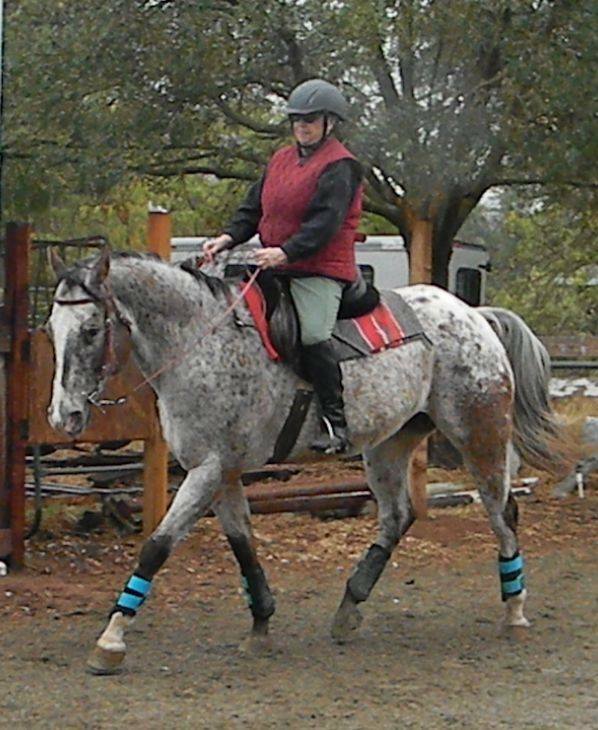 Flash back to “Dani”….16.3 hands, Dutch Warmblood with a good dose of Thoroughbred and a hyper-reactive nature that could propel her across an arena with one stride, jet speed, only to resume her collected trot instantaneously. She intimidated many people, and yet she had such trust in her “Mom” that she managed to stand like a rock in the middle of a test as two horses broke loose and galloped across the arena. She was a horse I never hoped, or wanted, to ride, which brings us to my moment. One day my daughter suggested I ride Dani, just to see what she was like to sit on. Uncertain and a bit doubtful, I climbed into the saddle. I had trusted my daughter all along this journey, so why not try? This was a mare that reacted badly to heavy hands, and always worked on a rubber bit-the only one she would tolerate! You can bet that I concentrated on not interfering with my hands and tried to follow every one of Lia’s instructions! Before I realized it, and to my surprise, we were cantering a circle. The word from the ground was bring her in, smaller circle, smaller, smaller. Believe me when I say there was no strain in my body, my hands had a soft feel of her mouth, and I didn’t have a clue what the hell we were doing, until suddenly…I felt like a soft wave was lifting and slightly turning me with each lift. We were staying on the same spot, only slightly shifting direction. Being my clumsy self, when the penny dropped I started to laugh, broke the spell, and didn’t quite complete the canter pirouette. Life went on and for many reasons I never got the opportunity to dance with her again, but the sensation lingers. No cranking on the bit, no spurs, no whip, no distorting my body. Just quietly “talking” to her and receiving her answer, and riding the wave! Mom’s first ride on her mustang, Ricky – breaking her first horse at age 53! There were other memorable moments riding, of course. The day I actually got Ben to take sideways steps without Lia coaching me, the day I was the first person to ride my mustang. But the moment of simple tiny shifts resulting in a comfortable, smooth dance step is what I am searching for after these years of on again off again riding, due to life circumstances. I will probably never have that high level movement at my disposal again, but the elements that brought it into being are possible. My Coffee horse now turns with the lightest of cues most of the time at the walk. Our communication/ conversation skills are improving. He will never have the talent, skill and beauty of Dani, but it is the memory of that moment on her back that lives in my mind, and allows me to realize the pure beauty of finite, mutual conversation with a willing dance partner. If that kind of feeling relates to Classical Dressage than that is my aim. In closing let me add that I feel compassion for any rider, including those….especially those…at the highest level who have to fight and force their equine partners into a frame and doing the “tricks” that will win them glory. At my age tomorrow is always problematic, but until that day I will continue my journey toward that feeling again and celebrate the small increments as they occur, because each step gets us closer to that feeling of dancing together, and that is beyond price. This entry was posted in Thinking Out Loud and tagged canter pirouette, Classical Dressage, Coffee, dancing with a horse, Dani, lightness of aids, partnership. Bookmark the permalink.